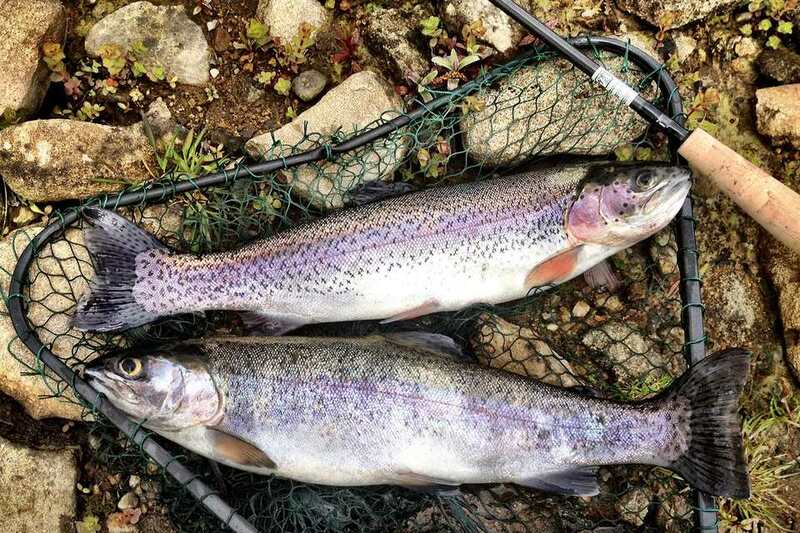 Although rainbow trout typically thrive in colder waters of the Appalachian and the Rocky Mountains, few people realize that portions of the Guadalupe River in the Texas Hill Country offer some excellent opportunities to catch these freshwater fish year-round. Located a short drive from Austin, the Canyon Tailrace, a stretch of the Guadalupe that extends several miles below Canyon Lake, maintains a low enough water temperature to support a good population of rainbow and a few brown trout as well; in recent years, this stretch of river has actually become a well-known fishery. There is not a wide variety of trout fishing options available throughout the year, though. Summertime trout are pretty much relegated to the Canyon Tailrace. However, the winter trout population in the Lone Star State grows rapidly as the Texas Parks and Wildlife Department goes about their annual winter trout stocking program from December through February. The intent of the TPW winter trout stocking program is to introduce people across the state to a different species of fish than they may be used to fishing for. With that in mind, Texas Parks and Wildlife stock over 250,000 rainbow trouts in rivers, streams, lakes, and municipal ponds across the state. Every major city in Texas has several stocking locations within driving distance. Many cities, such as Austin, Dallas, Houston, and San Antonio, have trout stocked in ponds within the city limits. However, the stocking is not limited to areas with large populations. Fish are also stocked in small Texas towns from Brownwood up in the Panhandle to Harlingen down in the South Texas Plains. All of the fish stocked in these ponds are done so with the intent that they will be caught and kept by anglers, as they cannot survive in these bodies of water once spring passes. In order to retain any fish in Texas, you must possess a valid Texas fishing license—resident or non-resident—and, for trout fishing purposes, a freshwater stamp. There is no length limit on trout and the daily bag limit is five per angler. So, although Texas may not rival the western states when it comes to trout fishing, there certainly are plenty of opportunities to get a “trout fix” in the Lone Star State—especially in the winter. If you happen to be heading to Texas during the winter months, odds are you’ll find a stocked location near your vacation destination. Each October, the Texas Parks and Wildlife department releases a list of locations they will stock for the winter (as well as when and how many trout are stocked). In the 2017 to 2018 winter season, for instance, TPW stocked over 300,000 rainbow trout in more than 50 destinations across the state. Among them, River Park (Clear Fork Trinity River) near Fort Worth, Possum Kingdom Tailrace near Graford, Fort Boggy State Park in Centerville, Comanche Trails Park in Odessa, and Canyon Tailrace in New Braunfels received the most trout. Stocking typically starts in late November and ends around the first of March as rainbow and brown trout left in the rivers, lakes, ponds, and streams will not survive when the weather begins to warm up.